It was not the best bike in the world, it wasn’t my favourite colour, not the fastest and nor did all the speeds work perfectly. But it was practical and reliable and it had been for over 20 years. It was a good quality bike over all, that freed me from having to rely on public transport and saved me both time and money. But these are things you can replace, that you can amend even, when getting a new bike. What you can’t replace is the memories connected to it; cycling as fast as you can in the light of the headlights of your friends dad’s car on a forest road, home from a party as a teenager; the drive taking it from Norway to France on the back of an old Renault 5; etc. etc. When someone’s house burns down, the insurance company can replace the house itself, but not the memorabilia it contains; all those photos and objects that have been acquired through a life time; gifted by a friend or a relative, bought or taken on a vacation. If your computer crashed, you would be most scared of loosing the photos (and of course any work you had on it), right? And what is that about? Your social relations. The anthropologist Daniel Miller (2005) puts it like this: “Social relations exist in and through our material worlds that often act in entirely unexpected ways that cannot be traced back to some clear sense of will or intention “. I can’t explain my attachment to my bike in any clear way, but I know it’s there, and I remember people and places connected to this bike. When it comes to theft, the feeling of violation of having something that is an integral part of your life stolen, can be harsh. If it is stolen from the place you live, it also removes that feeling of security that your home is supposed to provide. Luckily, my bike was stolen in the street where I had attached it. But having that bike was also part of a life style choice, not only the choice to have a bike to use for transport and physical activity, but the choice of keeping and caring for my belongings, valuing the history they represent, the people and memories they connect me to. Both are connected to the values of the sustainable life style that I try to keep. I am sure the culprit(s) did not think of all of this at the time, or don’t think of it in general. My readings in material culture studies have really confirmed how much we take things for granted. Miller (2005) would attribute this to what he calls ‘the humility of things’, the way they are seemingly insignificant but yet have a profound effect on us. In Gosden’s (2006) words: “People as social beings can be shaped in how they think and how they feel by objects. Ideas and feelings do not exist in cultural forms in a manner prior to things, but are created partly by them”. 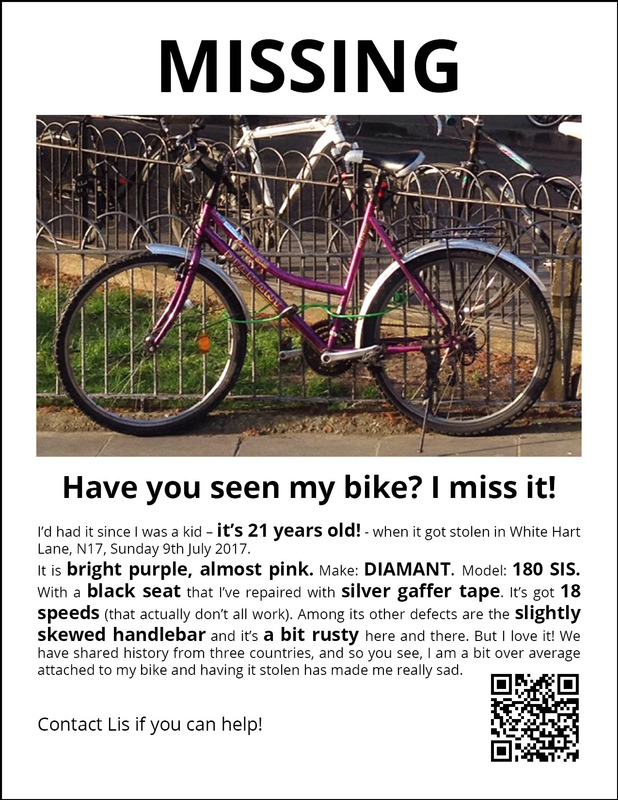 In my case, because my bike is so important to me, I’ve decided to go look for it, the way one looks for a missing pet. Putting up posters all over the place. Gosden, C. (2006) ‘Material culture and long-term change’ in Tilley C., Keane, W., Küchler, S., Rowlands, M. and Spyer, P. (eds) Handbook of material culture. London: SAGE, pp. 425-42. Miller, D. (2005) ‘Materiality: An introduction’, in Miller, D. (ed.) Materiality. Reprint, Durham: Duke University Press, 2006, pp. 1-50.